Venner departed with the hate still ugly in his eyes, with more hate for an innocent Hugh than for a guilty. The Venners would not be changed in their generation. I'm not going to provide many plot details for this book as I found it hugely beneficial to know next to nothing about this book. Every reveal, every additional detail that Hughes affords the reader changed the context of the story and how I read this. She did this masterfully. It is very much a story of telling you the facts, then changing one little thing, and suddenly the same facts appear different, more complex, more ... prone to consequence. Suddenly we get to understand why Hugh, our MC, is eager to keep his head down, does not want to engage, does not want to stand up for himself. It's because he can't. 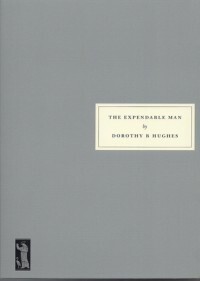 The Expendable Man tells a story of oppression (in more ways than one as we learn throughout the story) taking place in broad daylight. I was angry for Hugh, for his helplessness. And, yet, there are glimpses of hope in this book, too. These glimpses might just be individual characters but they were there and if we have learned anything it is that it only takes a few good people to inspire others.